An amazingly vigorous strain of this rare alba form of the easy-growing Paph. delenatii ! 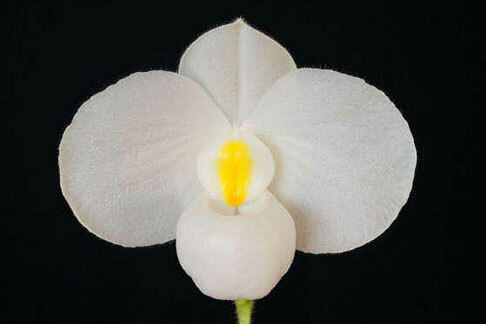 This particular strain grows to only half the size of a regular Paph. delenatii, producing blooming size plants in just 3” pots with a very compact 4” leaf span. To add to its charm, the leaves are beautifully mottled, making it attractive whether in flower or not. Exceptional for its pristine white charm, attractive foliage and small footprint, this alba form is ideal for under-lights, windowsill and space-challenged collections! Very Limited !